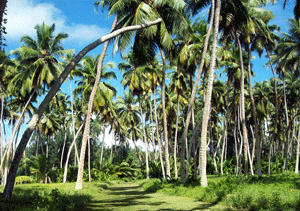 (Seychelles News Agency) – Touching down on many of the 115 islands of the Seychelles archipelago in the Indian Ocean, one cannot but notice the abundance of coconut trees lining the plateaus of the islands. 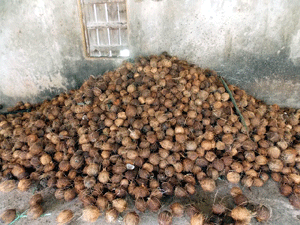 During the colonial times cultivation of coconut – often referred to as the tree of life and of many uses- for the oil and copra provided not only a reliable source of employment and income for the inhabitants of the islands but injected millions of rupees into the economy through the export of coconut products to various parts of the world. According to Seychelles archives record for example, between 1913 to 1920, the Indian Ocean archipelago was exporting coconut oil to Mauritius, India, South Africa, France and the UK. Over the years the high cost of production and stiff competition from coconut oil producing countries- mainly from the Asian continent- has rendered the Seychelles coconut industry more or less dormant despite the Island Development Company’s (IDC) efforts to revive the once booming industry. “The price of coconut oil on the international market had dropped considerably and it was not profitable then to trade on international market, therefore, we stopped the exportation of coconut oil,” IDC’s Deputy Chief Executive Officer, Ronny Renaud told SNA in an interview. Following interest shown by an overseas importer in Kenya, for the past two years IDC has been exporting raw coconut oil to Mombasa, where it is said to be popular amongst people in the rural areas who use it mainly for cooking and lighting. “In 2012 we started off with about 30 barrels per year” now we supply between 72 to 74 barrels in one container which comes to about 13 tonnes of coconut oil per consignment. 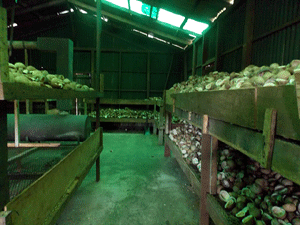 We supply about two, 20 feet long containers of coconut oil per year” said Renaud. Currently, the IDC is running two coconut oil processing plants; one on the island of Farquhar situated 770 kilometres from the Seychelles main island of Mahé and the other on Coetivy, located 290 kilometres from Mahé. It takes a day to reach Coetivy by cargo vessel whereas to get to Farquhar can take about two and a half to three days. One of the main challenges in this business is the transportation of the coconut oil from the outer islands to mainland Mahé. “Our limitation is the frequency of transportation between the islands. Every three months our boat goes to Farquhar while we have trips to Coetivy every two months which equals to about four trips per year to Farquhar and six trips to Coetivy every year. Then, from Mahé we sometimes have to wait for the connecting cargo ship to Mombasa. Taking all this into consideration we have to take note of the lifespan of the oil too as the quality can deteriorate,” remarked Renaud. 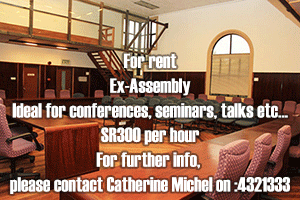 At the moment, IDC employs some 35 Seychellois working at both processing plants. Locally, coconut oil is still being used for cooking in some homes and for cosmetic purposes such as for hair care to remove dandruff and sooth dry scalps and skin. Coconut oil is equally believed to have great health benefits such as in relieving of various ailments and for curing diseases. In Seychelles, it is commonly used by the elderly to cure malaise in infants. 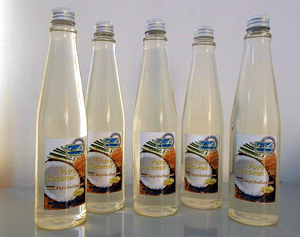 Up to now the IDC was selling coconut oil to local buyers in bulk at 10 Seychelles Rupees per litre ($0.80). They often use the oil to make scented soaps, candle and craft products or simply pack the oil into 750ml bottles for sale of about 35 to 45 rupees a bottle. “Some soap making businesses were buying coconut oil in bulk once every six months to be used in soap products. There was not the push to put more efforts and resources in the production of coconut oil because local market was not sufficient to satisfy the capacity of production” said Renaud. With the aim to revive the production and use of coconut oil locally as well, the IDC has now ventured into the packaging of its coconut oil instead of simply selling in bulk. The 200ml bottle which is already available at IDC is being sold at 15 Seychelles Rupees each equivalent to about $1.15. It will also be available in the local shops and souvenir boutiques across the country in the coming months. “We sold and gave out free samples of the bottled coconut oil to the public during the National Expo 2013, and the feedbacks were positive,” said Renaud adding that they are targeting visitors to the archipelago and locals alike. 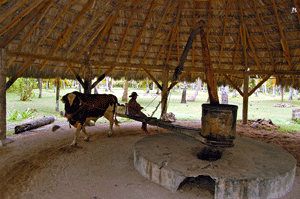 In the past coconut oil was extracted using an ox-powered coconut oil press. Fallen dried coconuts are handpicked and stacked up by the workers on the island. The coconuts are then de- husked and broken into cups to remove the coconut water. They are then layered into a kiln and heated at a constant temperature for a couple of days. Once cooled and left to dry in the sun- a process which takes about three more days- the coconut now known as copra are then broken up manually into smaller pieces and sent to an electric grinder. Eventually the oil is extracted, collected in containers and left to stand for one to two days. “This process is important to separate the brown matter from the coconut oil,” explained Renaud. “The clear liquid is then stored in barrels to be shipped to our warehouse on Mahé where they are bottled or sold in bulk”. Renaud points out that the Seychelles coconut oil is said to be one of the best in the world and this he said has been highlighted by several “experts and agronomist from the local Ministry of Natural Resources”. This has been “confirmed further by the current Kenyan importer,” added Renaud. “The difference between our coconut oil and those from other coconut oil producing countries mostly from the Asian continent such as the Philippines and Indonesia, is that we let the coconut mature in the trees. 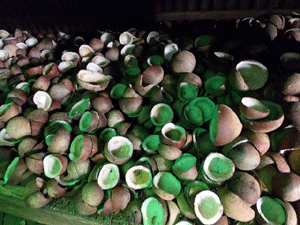 (…..) Once this happens, the coconut falls and we pick those on the ground and stack them up for some time before use”. In order to maintain the high quality of the Seychelles coconut oil and sustain this industry, Renaud explained that they are constantly planting new coconut trees to replace the ageing plantation at the same time exploring other islands where coconuts can be picked. 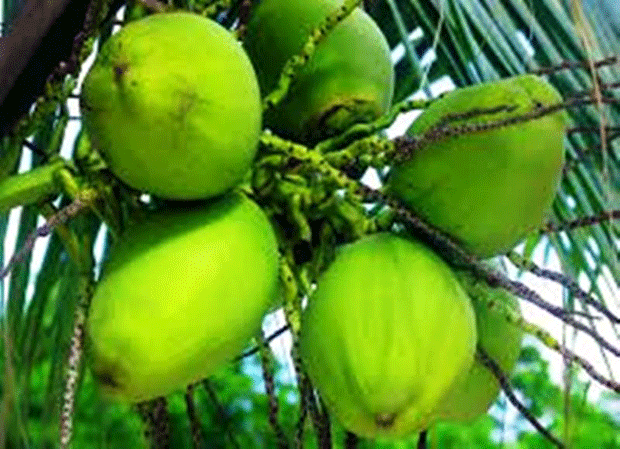 In view of the increasing demand for coconut oil from Seychelles and the increasing price of the product on the international market which can reach up to $1,400 dollars per tonne, Renaud said they have plans in the future to expand the coconut oil production business and diversify the product as well. 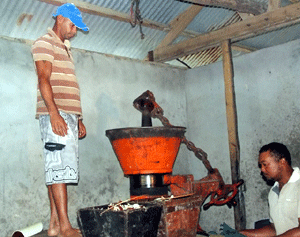 “We have already invested and purchased two new coconut oil processing plants. The system we use at the moment is out dated since the 80’s. We are already testing the new ones in our workshop” says Renaud. “Once in use we expect to double production. At the moment the plant on Coetivy is making 75 percent of our production”. In the future IDC wants to explore other projects such as producing virgin coconut oil (VCO), through the Alfa Laval oil separator system. 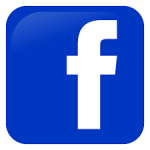 This creates a clearer and more refined product. “But first we must see if it’s economically viable. We need to see if there’s the market for it” cautioned Renaud. According to the United Nations Conference on Trade and Development, on the world market coconut oil production has been on the increase for the past decade. It’s estimated to have exceeded 6 million tonnes per year with the Philippines, Indonesia and India being the top three coconut oil producing countries in the world. The main destination markets for the coconut oil are the USA and Europe. IDC a parastatal body was set up in 1980, with the mission to manage and develop 14 islands, of the Seychelles archipelago. Other than coconut oil the company also produces salted fish, charcoal, coconut, zig broom made from the dried ridges of the coconut leaves, copra the dried coconut meat which is made by smoke, sun or kiln drying or a combination of the three and “pounac” the residue from grinded coconut meat used as animal feed. Next: A Seychelles brand inspired by the sea!